I am linking to Paint Party Friday, hosted by Eva and Kristin. Beautiful pieces today your doodled quill is so creative. Enjoyed your stunning photos today. That quote made me think, he couldn't have experienced flight, yet so beautiful what he imagined it to be...unless he meant flight in a different sense...thanks for sharing! Da Vinci made drawings of flying machines, and evidently dreamed from flight. Those pieces are wonderful. I especially love the pen and quill. that sky is just awesome. So nice to see the daffodils even if you think they are a bit scraggly. Ours are still buried under a foot of snow. More snow coming today. Your shop windows are just so pretty though it looks a bit chilly to be sitting outside. Oh wait, that's the weather here. Have a wonderful day! Your hybrid collage is sooo beautiful!!!! Love it!! Like your doodle quill very much! Superb pictures of the blue sky and from your walk in your sunny town! Spring is in the air at last!! Wishing you a lovely week ahead!Hugs! Love those cheery flowers and bunnies in the last two photos. And your doodles seem far more than doodles to me! 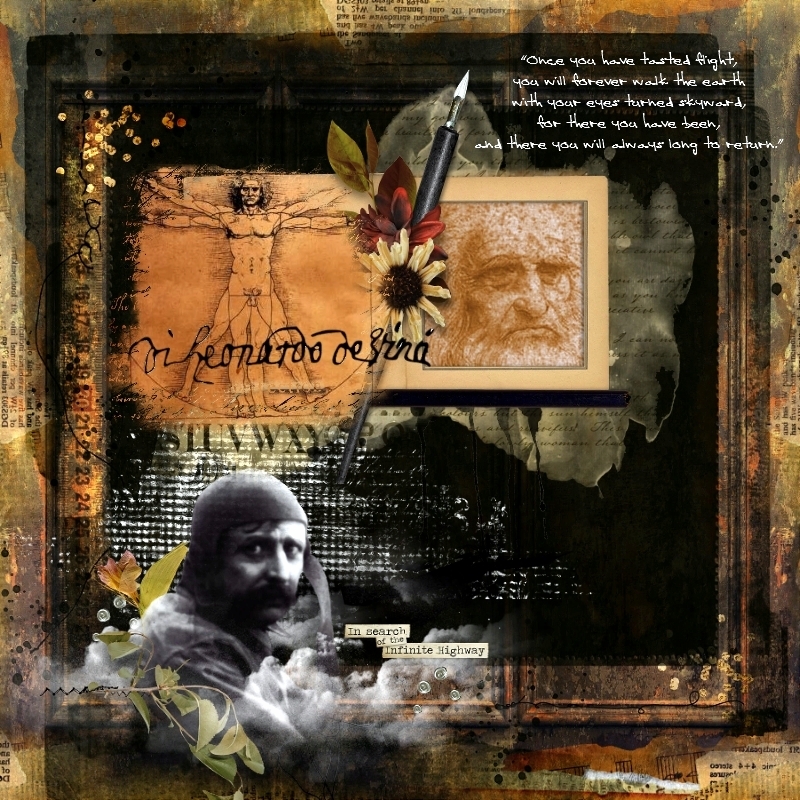 One of my favorite stamps is Vitruvian Man. Mine is quite small, but I truly love it. You certainly paid homage to Leonardo with this incredible entry. It is fabulous and moving. WOW on the quill drawing. I am totally impressed. Truly and totally. So glad it was dry enough you could get out for a walk today. My favorite photo is the tree branch. Hope your day is going well. BTW, I just got a new keyboard a few months ago. This one is doing the same as the previous one. Scott says the only way to get around the problem is to buy one you have to hardwire to the CPU, but I still prefer wireless. I had similar problems with my wireless mouse. Now I have a hard wired one and everything works. Strange and annoying. Fabulous artwork today Valerie, your doodling looks wonderful. Lovely photos of your walk, the sunshine makes all the difference. I love the sentiment, make someone happy write a letter today. I fear letter writing is going out of fashion and it is always so nice to receive a handwritten card or letter. Your photographs are just fabulous - we too have had blue skies today, and it's been wonderful. 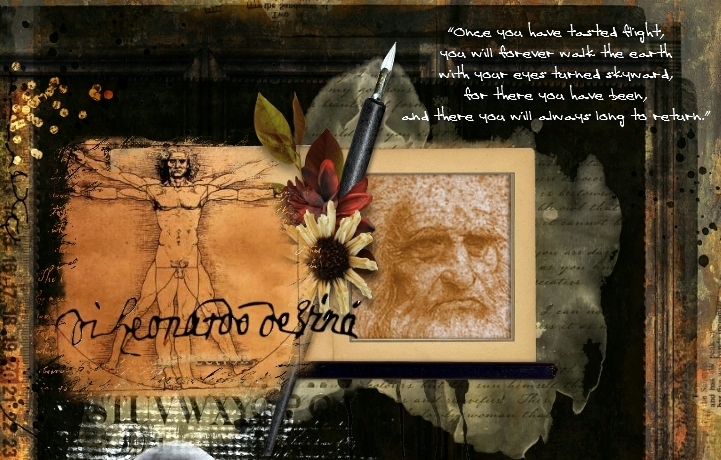 Your collage page looks awesome Valerie, I really like that quote as well, its a great tribute page to Leonardo. The quill looks fantastic, it must have taken you ages to add all those details. I still have a penfriend, who cannot get internet where she lives in a remote area on the Isle of Skye, we both look forward to getting regular letters. Wonderful photos again today, I loved the first ones of the morning sky. 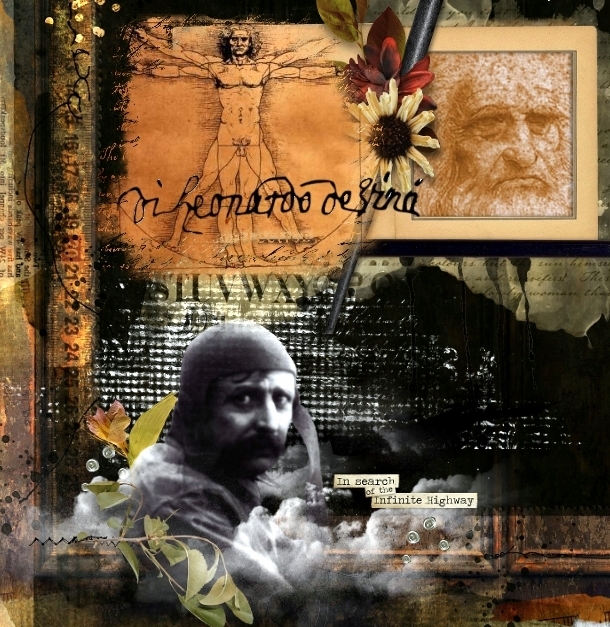 wahnsinn hybrid collage ist das und mit der Feder und Tintenfass grossartig der Hintergund dazu! Wunderschön sind alle zwei! Schöne Restwoche wünsche ich dir! Gorgeous collage Valerie and love your doodled quill, so striking. The sky photo is amazing too and glad you got out for a walk. I did the same this morning with a walk along the seafront which was very cold but it was sunny. I got to read it early Thursday! That last picture looks so springy. The sky is simply amazing. I love both Leonardo and your doodle quill. Your digital page is so cool but I really love the zentangle quill! What a great work of art. And the quote is perfect. I love writing and receiving letters. Such wonderful art, and what an amazing quote! I love the colourful Easter display in your final photo too! Those cloud photos are Amazing Valerie! How beautiful!! I really am digging your first piece as well...I don't know that I ever read that quote before, but surely will remember it now! And your doodling...well you inspire me with it every time! Love your collage. It has a very vintage feel to it. Your doodle is wonderful. Your artwork is gorgeous, as always, but your photographs never fail to make my heart sing. I can imagine a coffee table book of your photos... along with inspirational quotations or verses from the Bible. The sky photos always captivate me, but I really like the pics of the rotten branch and moss-covered wall, too. They're atmospheric, for one thing, but I have a distinct weakness for the beauty of wood. Lovely works of art and beautiful photos of your walk! Really loved the collage! And such beautiful, inspiring photos. You are so creative with your art pieces! Love them both! Gorgeous photos! WOW! Beautiful skies!! That wood photo is cool! Big Hugs! That sky!!!! How lucky you are to have caught it! Your collage and doodles are lovely this week!